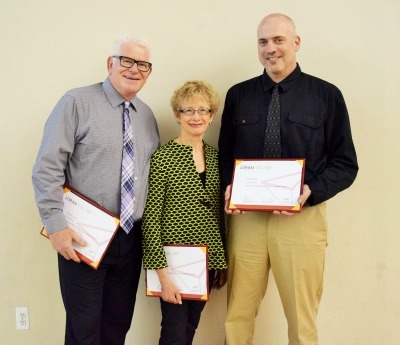 Kelowna Christian School (KCS) is excited to announce that the Loran Scholars Foundation has awarded three KCS teachers - Rick Rauser, Dwayne Schulz and Virginia Hallonquist - the prestigious Loran Teachers Building Leaders Award. Founded in 1988, the Loran Scholars Foundation is a national charity that works in partnership with Canadian universities, donors and volunteers throughout the country to invest in young people who demonstrate character, commitment to service and leadership potential. 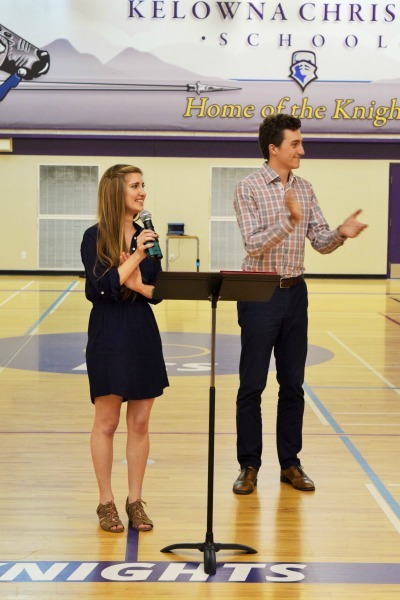 Kelowna Christian School is honoured to have three students win this national student Loran Award valued at up to $100,000 over four years for undergraduate studies in Canada - Devon Bourgeois (2016), Hayden Rodenkirchen (2012) and Christina Klassen (2011). The Loran Teachers Building Leaders Award was initiated in 2015 to recognize primary and secondary school teachers who go above and beyond in developing the character, service and leadership of their students. Veteran teachers "Rick Rauser and Dwayne Schulz excel at challenging students to think beyond themselves", said Darren Lewis, Lead Principal at Kelowna Christian School, "... to imagine the world as a better place and develop and build the tools to make it so". Virginia Hallonquist was the kind of teacher that would do anything for her students. Lewis explains that "when she had reached that point, she would do more". All three teachers, nominated by students, are loved by KCS families and our community. "We believe in life changing education that cultivates world changing students" said Schulz. Two world changing students, Klassen and Rodenkirchen, presented the teachers their awards during the award ceremony on May 30, 2016. “Teachers leave an indelible impression on the lives of their students and KCS in particular is lucky to benefit from faculty who challenge and support students not only to succeed in the classroom, but also to live a life of character, service, and leadership” said Christina Klassen. Hayden Rodenkirchen shared how “Mr. Schulz fostered an open intellectual environment that allowed everyone, even contrarians like me, to be heard and, importantly, challenged”. Students felt able and excited to share their views, anxieties and questions because they knew Mr. Schulz was supporting them and that they were all there together for one reason – “to get closer to the truth and to discover something about ourselves and the world we live in”. Mr Schulz’s integrity and compassionate community engagement are a profound example to his students. Whether arranging trips to the Okanagan Gleaners, Kelowna Gospel Mission, the law courts, or for a rugby player like Rodenkirchen to the hospital, Mr. Schulz shows his students how to live with meaning at the core and others at the forefront. Klassen explained how Mr. Rauser’s lessons were never designed to facilitate content memorization alone, but rather to connect us to the world at large and to think about our role in it. “He taught empathy at a deep level and never treated us as too young or immature to understand complex social issues, but rather as young intellectuals capable of deep discussion and questioning whether we had the highest or lowest marks in the class” shares Klassen. Rodenkirchen added how Mr. Rauser’s confidence in each student helped them build confidence in themselves and their intellectual abilities. Mrs. Hallonquist recently retired from KCS, but was one that always went above and beyond her job description as Student Counsellor. Klassen explained how Mrs. Hallonquist urged her to consider applying for the Loran Award, and was the one who drove her to UBCO for regional interviews, as well as prayed and practiced with her in preparation since Klassen’s parents were out of town. Hallonquist was full of resources and connections, and always had “her finger on the pulse of what opportunities lay out there for students” said Klassen. A true gem, Virginia Hallonquist still keeps in touch with many KCS students and is always enthusiastically there to support student’s to discover and pursue their dreams.